If you live in West Knoxville and like shortcuts, you’ve driven past it hundreds of time–this old, old graveyard not quite at the corner of Westland and Ebenezer, sitting right in front of the driveway to the Maple Grove Inn. Nameless, signless, churchless, this cemetery has been a final resting place for Knoxvillians for about 200 years, and is still being used today. It has a name, actually, although I had to look elsewhere to find it–two names, really, depending on your source. KGIS calls it Ebenezer Cemetery; Find-a-Grave calls it Cedar Springs. KGIS lists the cemetery itself as the owner; other sources indicate that it is owned by Cedar Springs Presbyterian Church, which locals will recognize as the home of a prominent congregation with a large complex of buildings a mile or so north of the cemetery. If Cedar Springs owns it, you wouldn’t know it from their website. I was disappointed by the absence of any reference to the history of the cemetery or even to the history of the church–which surely must be a rich one after 200 years. As you can see above, whoever owns it no longer maintains the sign that once indicated (I presume) grave locations. This isn’t going to be one of those posts where I complain about the condition of the cemetery. At least someone is mowing this one regularly. Sure, there are a few broken stones, and some of the plots could use some hand weeding, but relative to some of the places I’ve visited, it’s in decent shape. There are broken and unreadable stones, and a lot of bent wrought iron, but I suppose that’s to be expected in a place of this age. I didn’t find as many graves of babies and little children as usual, but probably that’s because so many of the old stones are illegible. God in Heaven can only know. How often does our thoughts on this silent tomb rove. Check out (if you can decipher it) the inscription below–laid to rest in Knoxville, this person started out life in Iceland. I would love to know what prompted a move to Tennessee. I love the hand-lettered stones. Just imagine someone in the throes of grief making this stone to ensure the protection of the memory of a loved one. Here’s another one that looks like there might be an interesting story behind it. I’ve shared some poetic epitaphs above, but even the shorter ones will touch your heart. If there is none she made the best of this. Friendly graveyard tip: If you want to make sure your stone remains above ground and readable, don’t get one of these. Just don’t. You may think that you’ve picked a well-maintained cemetery and don’t have to worry about this kind of thing, but you never know. This is one of the earliest graves here. Since the church was established in the late 1700s, I don’t know where they were burying people before that, but the earliest burial here was 1821. The most recent was 2015. I’m sharing this because so far I’ve never seen another stone like it! That’s one of the fun things about cemeteries this old: the variety of stones you encounter. I thought this one was especially pretty. Here’s a name I recognize, and you will too, since Peters Road is just a few blocks away. I am sure this cemetery is brimming over with people important to the history of the area–it would have to be, with its age and size–and it was frustrating not to be able to read so many of the stones. Presumably this is a member of the Baker family whose house is thankfully preserved as a restaurant at the corner of Peters Road and Kingston Pike. Here’s another name I’ve seen around the area, and someone is still leaving flowers on this 114-year-old grave. As I’ve said, many stones are unreadable in this graveyard, but luckily for us there is Find-a-Grave. So I can tell you that some of the more frequently occurring names here include Beal, Bean, Bond, Brown, Coker, Medlin, McClellan, Nelson, Peters, Stone, Swan, Tillery, and Walker, some of which should sound familiar to anyone local. Victory Chapel Baptist Church (formerly Ebenezer Methodist Church, the successor of which–I’m assuming–is just on the other side of Ebenezer Road) stands right across the driveway from the cemetery, and it, too, has a graveyard–small, flat, immaculately kept. You’ll see many of the same names here, and in fact it looks to me as if a few people were relocated here at some point. I was very surprised when I was doing my bit of research on Find-a-Grave that I have a friend buried here. Also, Conrad Cook, a noted gospel singer and songwriter, rests in this cemetery. So, in sum, this is a lovely historic cemetery and I enjoyed my visit. But my time there was tinged with sadness too because this is a place that could be–and should be–so much more. See, whoever this cemetery belongs to, as old as it is it really belongs to all of us with ties to this area, because it’s our history too. And when we can’t read the stones, that history gets lost. The PEOPLE get lost. That’s a tragedy and it doesn’t have to be that way. Obviously there used to be a sign here with at least some information. How much would it cost–both in money and time–to put up a sign with the name of the cemetery, maybe a plaque with a little of its history, and a list of who is buried there and where their graves lie? What can those with the responsibility for taking care of graveyards do to ensure that when we inscribe the words “Gone but not forgotten” on a stone, we are telling the truth? If you enjoyed this and want to read more of my cemetery stories, you can find them HERE. Thank you! Yes, I have heard of a pet cemetery locally although I don’t know where it is. That might actually be interesting to do! I will get to Greenwood eventually–I have family and friends there. I appreciate your encouragement! I used to play in that cemetery as a child. My friend’s dad’s boss lived in the house that is now Maple Grove Inn, and we would go over there, swim in the pool, pick beans in the garden, and play in the cemetery. I loved that place! Thank you for another great cemetery tour. Always fun to read. I’m not from your area but we have similar old cemeteries in my home town too. Some are well kept and others are forgotten. It is sad to see them uncared for but I must say the one visited is in relatively good shape. Oh, absolutely! My concern with this one is with lost history–or a lost opportunity to acquaint people with the history–rather than with upkeep. I’ve visited several that were in truly bad shape (and gotten myself into trouble a few times by pointing that out!). Thanks for reading and commenting. Wow. This is great. We have a couple of these cemeteries in and around older parts of Denver. Over on the Western Slope of Colorado, there are lots of small towns with these as well. The one here that intrigued me most was the one from the Revolutionary War. There could have been more but one really stood out for me. Thanks. Great adventure and explanations. Very, very interesting. Fascinating post! I think it is so important to pray for the deceased and remember that we are dust and unto dust we shall return. Thank you for this story. I have many relatives in this cemetery with the surnames Anderson, Bean, Craig, and Murphy. I have also wondered who is responsible for this cemetery. Obviously someone is because it is mowed and there are newer burials. Perhaps someone at Cedar Springs Presbyterian is in charge of it, but since it is not located near the present church, it is not mentioned on their website. Again, thank you for highlighting this cemetery! Call me at 865-250-5583 and I can update you on the historic Ebenezer Cemetery (Cedar Springs Presbyterian Church). I love old cemeteries and hunting for ancestors. I also wish they were given a little more respect by their communities. My Mom and I discovered that spraying old stones with a water bottle allows you to read them. They are already out in the elements, so water should not hurt the stones. I found an ancestor from the 1640’s in Massachusetts-a big thrill! Thanks for that tip, Michele! I will buy a water bottle and bring it with me from now on. 1640s–that is REALLY exciting! I have an ancestor traced back to the 1600s in Pennsylvania, but I don’t think anyone knows where he was buried. I have a 5th great-grandfather supposedly buried locally but have yet to find the time to drive out to that particular graveyard. Maybe this fall! 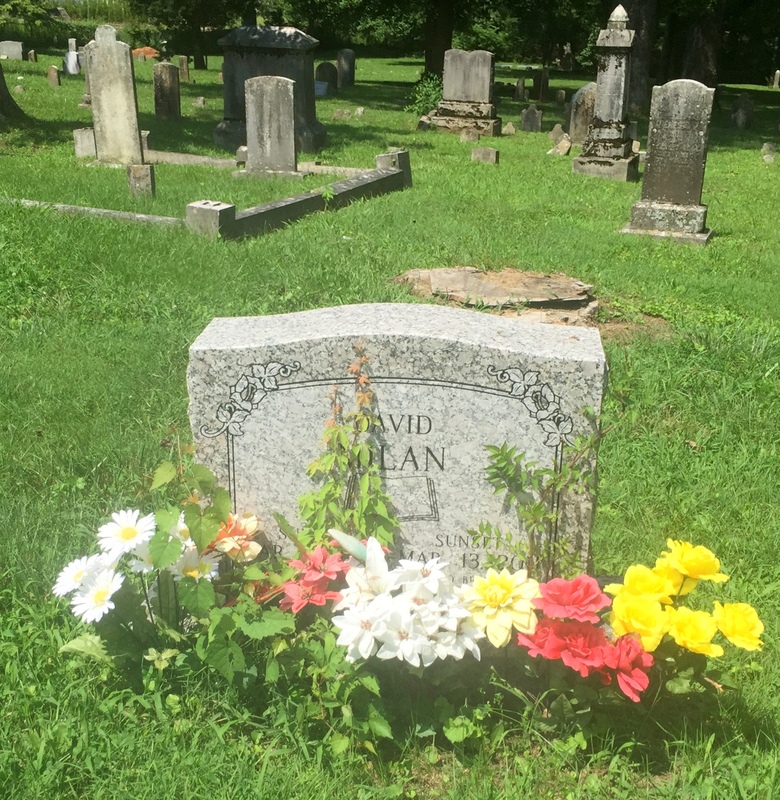 Hi, thanks for the awesome post and pictures of the Ebenezer/Cedar Springs Cemetery! I came across this page during a random Google search. I live about half a mile away from there and I drive past it a couple of times a week. One of my hobbies is researching & photographing local history in the Knoxville area, not just cemeteries, but also houses, buildings, roads, etc. I have a website where I have posted my pictures and the information I have found about different historic sites around town. I was at the McClung Collection downtown and I found some more information about Ebenezer Cemetery in a book called “Miscellaneous Knox County Tombstone Inscriptions, Vol. 1 & 2.” In this book, someone named Roscoe C. d’Armand did a write-up on the history of the cemetery back in 1964. If I recall correctly, there is a list of all the known interments (as of 1964, of course). He said that the earliest marked grave there is for John Swan, who died on August 13, 1804. My website has pictures of this gravestone, in case you did not see it when you visited. Apparently, John Swan was also the person who donated the land for the cemetery, back on July 31, 1797. Feel free to check out my page about Ebenezer Cemetery! (https://sites.google.com/site/tnhistoryproject/home/1790s/1796–ebenezer-cemetery) I have a bunch of other pages on my site for other historic sites in the area, too, all dating from 1865 and before. I think there are a little more than 150 locations on my site, so far. Anyway, I just thought you might find my info about Ebenezer Cemetery interesting, and you might want to check out the Knox County Tombstone Inscriptions book, if you have not already.